1. I thought I would expand on the weekend get-away theme, since my husband thinks I missed a few highlights from the picturesque views. Linking up with Jen for my seven. Hang with me to the end for a sweet surprise! 2. Be sure of this, plan a vacation and you are guaranteed it will rain, all day rain, all night rain, I guess when it rains, it pours. 3. If I ever need a lesson in humility, I know where to turn. We decided to take our chances in between the all too frequent rain showers and try our hand at some mini-golf. I grew up golfing, took lessons as a youngster and played throughout junior high and high school. I am not saying that makes me good at the game, but experienced. My husband had never played a round of golf until we started dating, the only swing he knew was baseball. Dare I say he catches on quick and mini-golf was no exception. Ahead on the leader board, he quickly put me in my place with several hole in ones. Anything I can do, he always does better. I guess it keeps the competitive spirit alive! 4. We enjoyed brunch at a cute little bed and breakfast, which a co-worker had recommended. 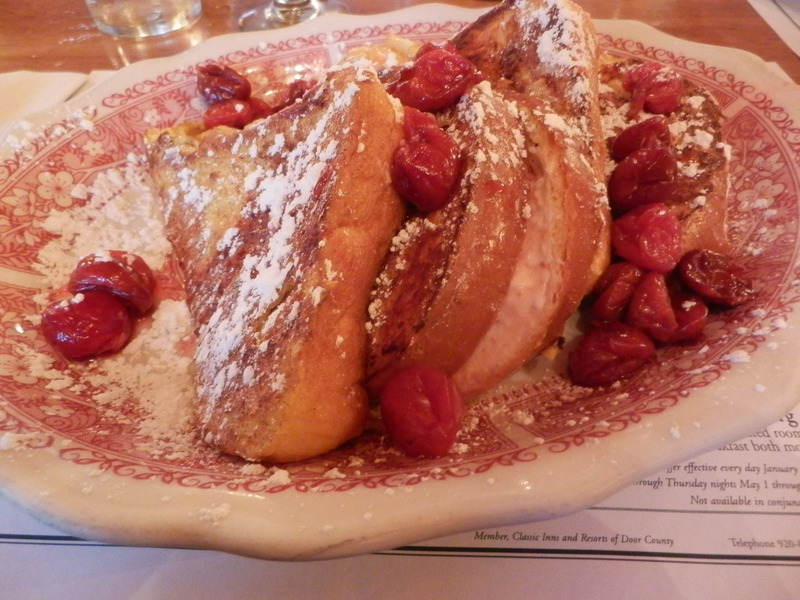 Cherry Stuffed French Toast!! The picture hardly does justice, as I sheepishly took out my camera to grab a quick shot of this breakfast beauty. Featured on Good Morning America, absolutely THE BEST!!! I’d say something to write home about or at least on the blog. 5. Beginning to walk out of the restaurant, the table next to ours flagged us down. What proceeded was 20 questions themed What’s My Occupation. I guess the area draws some friendly folk. First the questioning started about the printing on my husband’s shirt and they wanted to know if he was a lumberjack. Then they asked if he lived in the mountains. Finally the wife blurts out, you are a pastor! Thinking she had to be right, because she certainly saw us bow our heads for grace before digging in. 6. 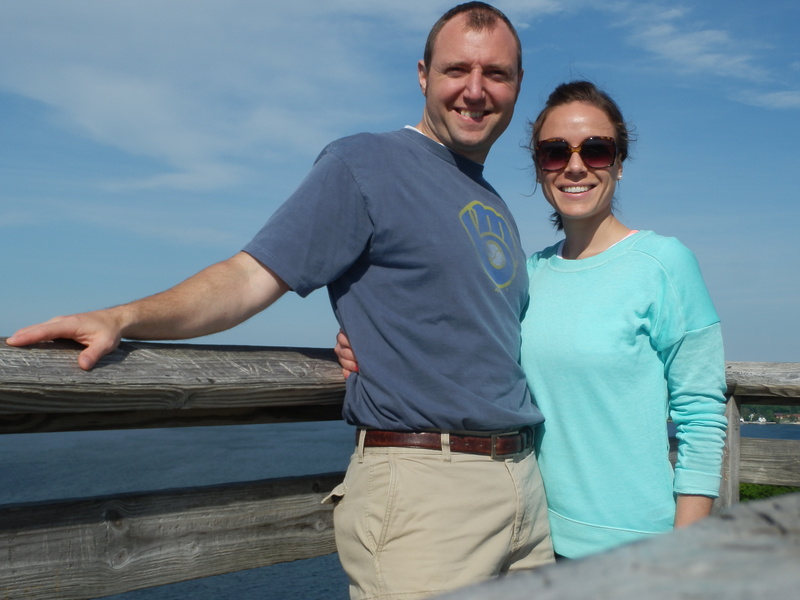 Our weekend of relaxation took place in Door County, a beautiful and quaint area located on the peninsula and now I will officially label it Land of the Cherry. The options were endless and it seemed nothing was missed…cherry salsa, cherry pie, cherry vinegar, cherry pancakes, cherry wine, cherry juice, cherry cheese, cherry ice cream, cherry BBQ sauce, cherry mustard, cherry syrup, cherry granola and the list continues. 7. BONUS: I went to find the link to the Cherry Stuffed French Toast on Good Morning America and happened upon the recipe!! Now everyone can share in the cherry love. I guess this is your reward if you persevered through all of my takes and we surely know you deserve it! Sounds like a lovely (and yummy) time!!! 🙂 it always seems to rain when we go on vacation, even in San Diego last year, but we have fun anyway. I miss door county, it’s been a long time. …as for mini golf, it’s the one “sport” or game where we’re actually evenly matched, and I win pretty often. Enjoy the rest of your weekend.